In an age of big data, AB testing and data driven results, it is easier today – now more than ever – for communicators and marketers to heavily target their campaigns. Thanks to social media and the amount of information we, as users, provide companies like Facebook, Instagram and Twitter, communicators and marketers can drill down to the exact audience they are trying to reach. For professionals, this allows us to stretch increasingly shrinking budgets, create more effective ads, and for consumers, this results in clearing newsfeeds of clutter and ads we don’t want or need. According to Harvard Business School professor John Deighton in DMNews, data-driven marketing spend is a little under 20% of the $1.3 trillion total annual marketing spend in the United States. So, in this age of data, is there still room for intuition? What happened to trusting your gut or instinct? According to a new report by the Institute for Public Relations, a non-profit that conducts PR research, and Peppercomm, a digital communications agency, senior communicators and marketing executives are choosing their gut over data. It is no surprise that senior executives rely on their gut, especially when Forbes reports that hackers are making $5 million a day by faking 300 million video views on various social networks, and the Guardian reported that Facebook claims your ad could reach more young people than exist in the UK. So what should our listeners do? Understand the data: one thing the Guardian article, quoted above, didn’t take into account is that people travelling through the U.K. may have also been targeted by the ad. Make sure you understand what the data is saying to make an informed decision. 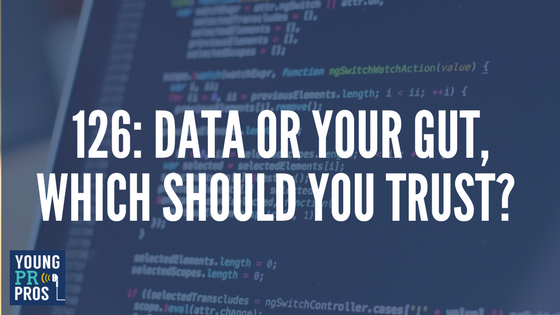 Trust your gut, but use data to refine it: always start with intuition, it will, most of the time, lead your in the right direction. However, use data to dive into the specifics and make sure your messages and campaigns are reaching highly targeted audiences. Check out Ross’ really entertaining blog post about the most creative ways to use Twitters new 280 limit. MarkingProfs.com outlines the social media trifecta. The article outlines the magic when you use a healthy mix of owned, paid and earned media. This entry was posted in Young PR Pros podcast and tagged big data, career, career advice, clare bonnyman, communications, data, julia kent, kristine d'arbelles, PR, professionals, ross simmonds, young pr pros, youngprpros by Kristine D'Arbelles. Bookmark the permalink.